It’s well documented that Charlie and my go-to lazy Sunday night dinner—what we’ve come to refer to as “our dinner”—is a rotisserie chicken from down the street. Sometimes we eat it with a simple salad. 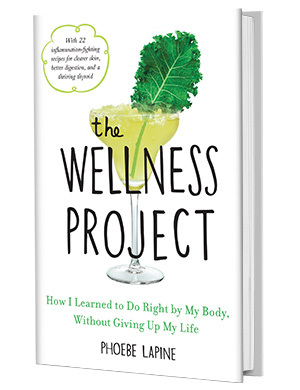 Other times, to maximize the quantity of condiments we can consume in the same sitting, we make a quick batch of baked sweet potato fries from The Wellness Project book. The truth is, though, even when I have slightly more time to fix dinner, I still fall back on this holy trinity. 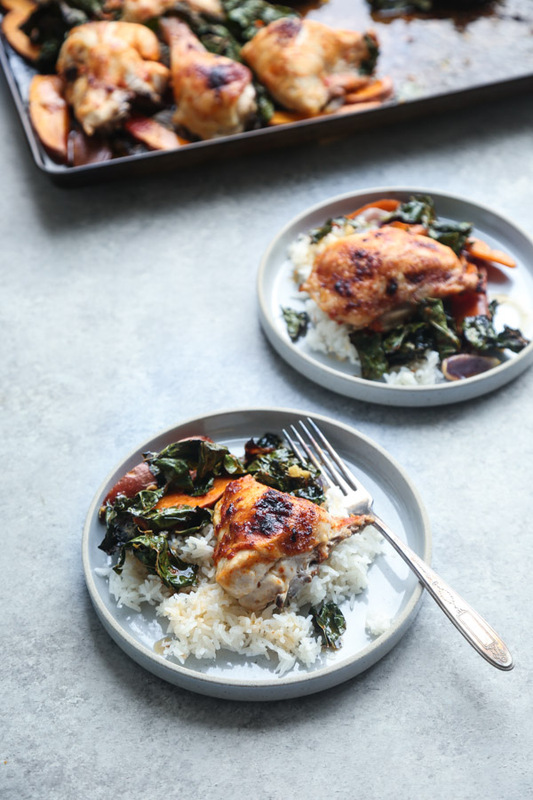 And no time does it come together as easy, quick and delicious as when I’m making this red curry sheet pan chicken recipe with sweet potatoes and crispy kale. This past weekend I ventured out to the mountains of Colorado with a group of fellow odd food job babes to celebrate Tieghan Gerard’s new paper baby, The Half Baked Harvest Cookbook. It was a trip that was hard to turn down, but also came amidst a seriously packed book tour schedule—DC tonight, Philly Thursday!—and a hectic week of preparing to be away from my desk. Instead of falling back on our Sunday night dinner on repeat for the entire week, I decided to take all its best components and turn it into something fully homemade: a sheet pan chicken dinner with a tangy marinade to create the perfect sweet and spicy jus. 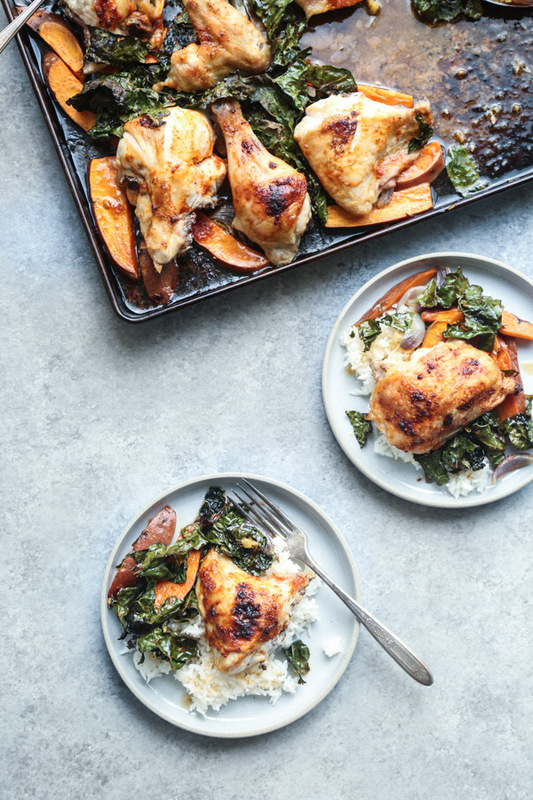 You can make this sheet pan dinner with any type of chicken, but it’s always more price-efficient to buy the whole bird. If you have a butcher on hand, just ask him/her to break it down for you into pieces. Otherwise, you can use any parts you like. Dark meat will fare better as a roast, and keeping skin-on and bone-in will keep the breasts juicy if you prefer white meat. The marinade is a play on this dressing from last fall, which easily became one of my favorite pan-Asian concoctions for salads. Instead of the sambal olek, I used Thai red curry paste. You can of course substitute any spicy condiment you have on hand—harissa for a Moroccan twist, gochujang for a Korean flair. The spice gets offset with a little maple syrup for sweetness, but you can omit it if you’re going the Whole30 route or reducing your sugar intake. 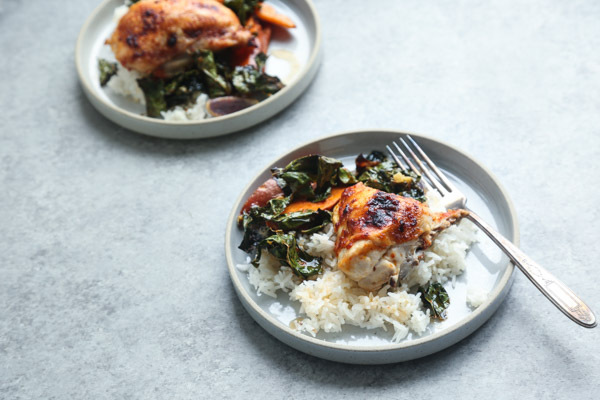 Any roots will work as the bed for the chicken, but the true veggie star of the dish is the kale. The greens get massaged with the same marinade as the chicken, then nestled in between pieces of the roasted bird. A quick trip to the oven renders some pieces wilted and tender, the top pieces perfectly crispy for added texture. Though it was an epic weekend of eating in Colorado (more on that later), I’m excited to return to the last Tupperware container of leftover red curry chicken waiting for me upon arrival. Assuming my other half didn’t already enjoy “our dinner” by himself. 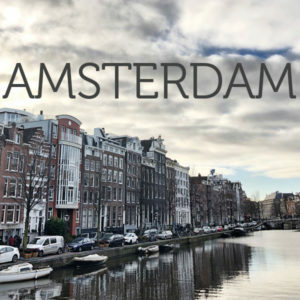 I hope to meet some of you this week on the road! 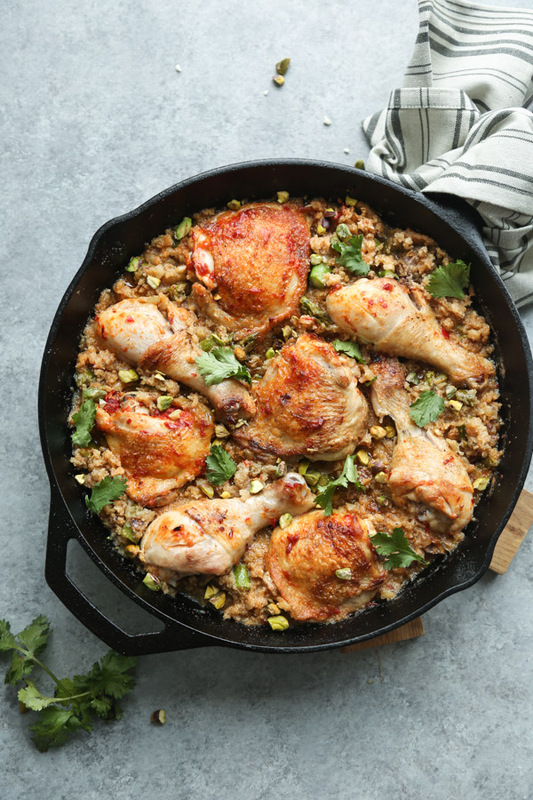 This sheet pan chicken dinner is one of my favorite low-fuss complete meals. 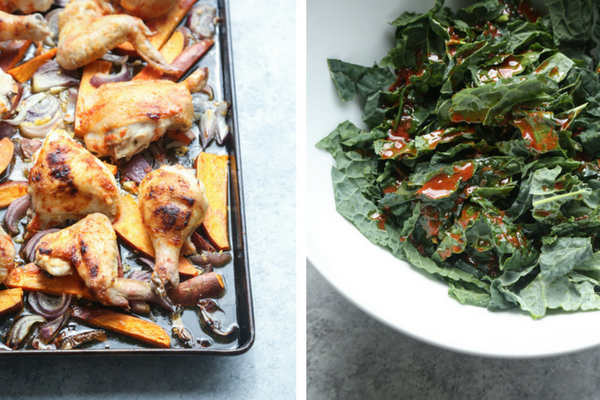 Thanks to the sweet potatoes and kale, the recipe is also completely paleo. If you don’t care about such things, you can bulk up your plate with some coconut rice or quinoa pilaf. But it’s not necessary. Also, if you like more of a sauce, double the red curry marinade in step 3 and serve the excess as a dressing on the side. On a large rimmed baking sheet, toss the sweet potatoes, red onion, garlic and ginger with 1 tablespoon of olive oil and 1/2 teaspoon salt. 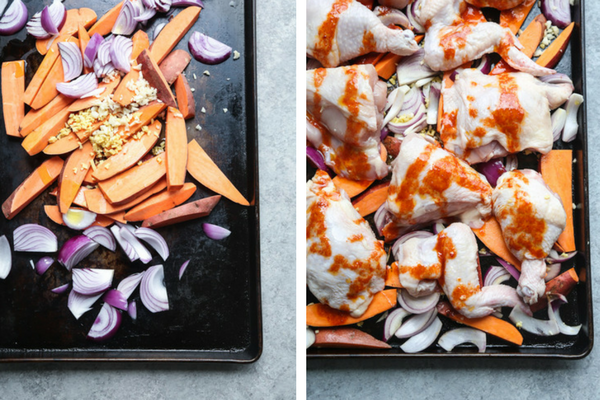 Arrange in an even layer on the sheet pan. 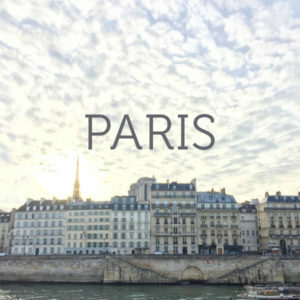 In a small mixing bowl or one-cup measure, whisk together the curry paste, lemon juice, maple syrup, 2 tablespoons olive oil and 1/2 teaspoon salt until combined. Arrange the chicken pieces in an even layer on top of the vegetables. Drizzle the chicken with half the red curry mixture and using your hands (or a brush for the squeamish) rub the marinade all over the meat. 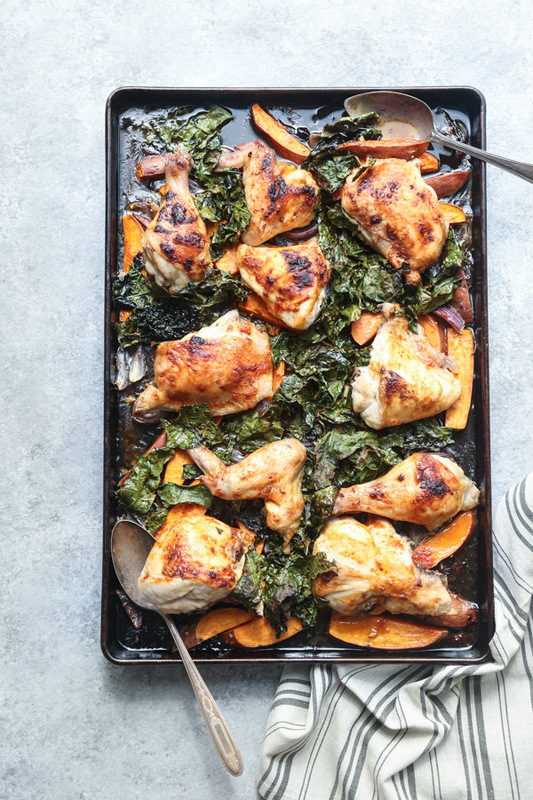 Transfer the sheet pan to the oven and roast for 40 minutes, or until the skin is beginning to brown and the chicken has released some juicy goodness. While the chicken roasts, prep the kale. In a large mixing bowl, combine the chopped leaves with the remaining red curry mixture. Toss until fully coated. 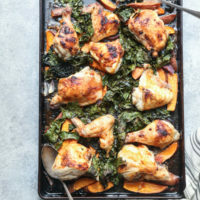 Remove the chicken from the oven and nestle the marinated kale among the other vegetables (if it covers the chicken, no worries). Return to the oven and cook for another 10 minutes, or until the kale is wilted and the top leaves are beginning to crisp. 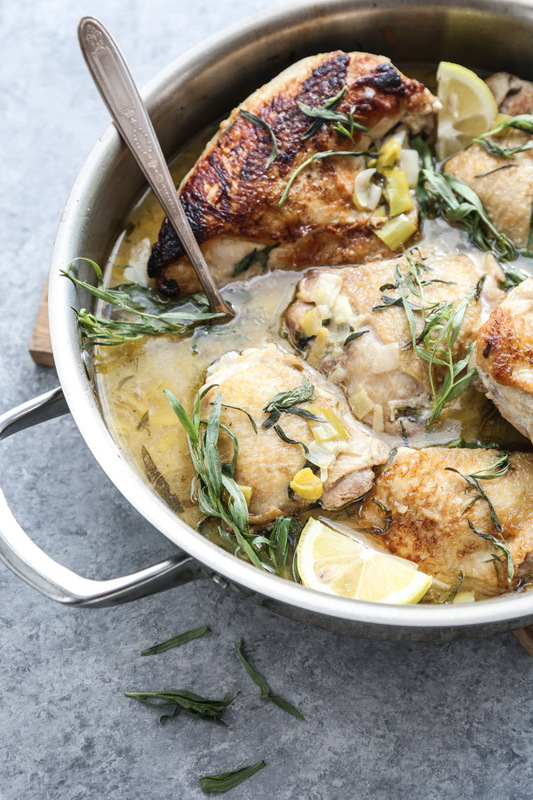 Serve the chicken straight from the pan for a rustic presentation. Coconut rice makes a nice accompaniment, but is not necessary. You can ask your butcher to breakdown the bird for you and specify to separate thighs from drums and to cut the breasts in half. If you don’t have a butcher on hand, simply buy two bone-in skin-on breasts, thighs, drums and wings. You can of course substitute any type of chicken meat you prefer, but dark meat will fair better as a roast, and skin/bone will help keep the breasts juicy. If you can’t find red curry paste, some alternatives are Moroccan harissa, sambal olek, or just plain Jane sriracha. If using the latter, double the quantity. 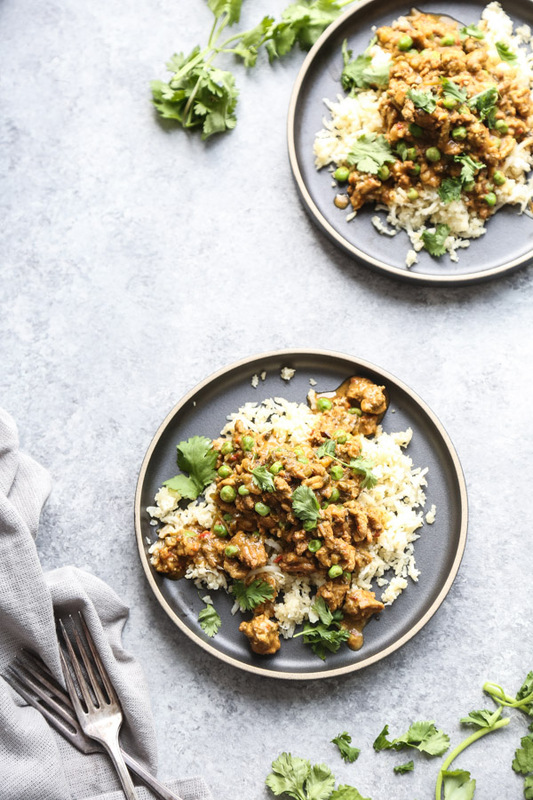 To make this recipe Whole30-friendly, simply omit the maple syrup and choose a compliant red curry option like Thai Kitchen. It will still be delicious!